Freeman Dyson who is a hero of mine is someone who has done lots of interesting things during a long and fruitful life. If you look at his writings or talks it is easy to mistake him as a philosopher of science. But as he himself said to me during a long, one-on-one, intellectually sparkling lunch discussion two years ago, a lot of people think that talking about the big picture automatically makes one a philosopher. Dyson has indeed written about a lot of big picture topics, from the origins of life to the colonization of space. But he also maintains that he has always been first and foremost a problem solver, someone who is much more interested in details than in grand theorizing. Whatever philosophy he manages to weave is built on a foundation of solving specific technical problems. This is partly evidenced by his work on highly technical engineering projects ranging from nuclear spaceships to nuclear reactors. This quality would make Dyson quite comfortable in the company of chemists, since chemistry by its very nature is more a problem-solving discipline rather than a philosophical pursuit like cosmology. I was curious to know Dyson's views on chemistry since he has not really written anything of note on the subject except a review in Physics Today of Roald Hoffmann's fine book "The Same and Not the Same". ...I learned chemistry from Christopher Longuet-Higgins who was already much more of an expert and more excited about chemistry than Eric James. And I remember Christopher bringing to Winchester some crystals of stannic iodide which he had made, which is the most marvelous stuff. It is a brilliant scarlet colour and it makes these beautiful scarlet crystals, and they're also extremely heavy. If you have a little bottle full of it, it feels like lead. So that kind of chemistry I found delightful, just the sort of details of the actual stuff, rather than the theory that lay behind it. I remember the joy when, here in Princeton, Willard Libby came on a visit once and brought along another little bottle of chemicals, which also was very heavy, and that was barium xenate, which was barium xenon oxide, which of course was an absolute revelation because nobody imagined that xenon could have compounds, being an inert gas. And it was sometime in the 1950s these compounds were discovered, and barium xenate is just such an ordinary stuff. It's a sort of heavy white crystals which are completely stable, they don't show any signs of anything strange and there it is. If you heat them up of course the xenon comes bubbling off..."
So there, I think Dyson would have felt right at home as a chemist. And the point he makes is an obvious and important one that is often lost among the cliched caricatures of chemists bubbling frothy liquids and crystallizing colorful solids that one often sees in literature and cinema. But it's precisely these bubbling liquids and colorful solids that provide chemistry with a palpable reality that's often missing from more theoretical sciences. A personal digression. I remember an episode from an undergraduate chemistry lab where we were supposed to estimate two unknown metal ions from a solution. After trying out every test in the book we could only detect copper. The other ion remained a mystery and we finally threw up our hands. That's when the instructor revealed his trick. It turns out that the method of copper estimation that we were using involved turning the solution highly acidic with hydrochloric acid. With a smile on his face, the instructor put a single drop of the concentrated acidic solution in a large flask and then filled the flask to the brim with water, diluting the initial solution by at least a factor of ten thousand. 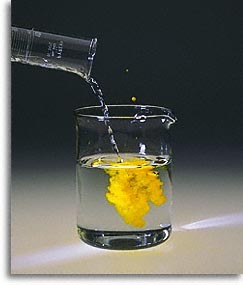 Our eyes were glued to the flask as he passed hydrogen sulfide gas into the solution. And then, starting from the bottom and rising to the top, the flask filled up with the most beautiful yellow color that I have ever seen; it's a sight that I will never forget. What happens is that cadmium is precipitated as cadmium sulfide only in dilute acidic solutions while for copper it's the opposite. All our tests for detecting copper in concentrated acid missed the hidden cadmium, until it was ready to be unmasked by simple dilution. Every chemist among us is familiar with this feeling of discovering something unknown, no matter how trivial or important, that actually exists; all the better if it has a brilliant scarlet or full-throated yellow color, as is often the case in chemistry. Dyson is right that there is something unmistakably reassuring, in-your-face - real - about holding a vial of something that was previously considered impossible. Physicists often like to tell the story of how Einstein felt that "something had snapped inside" him when he saw the predictions of general relativity confirmed by observations of the perihelion of mercury. He surely must have felt the rare, once-in-a-lifetime satisfaction of a great theoretical construct being validated by a real observation that could be boiled down to a single number. We tend to think of Einstein as the great scientist-philosopher, but there he was, being ecstatic about a technical detail that was a crucial part of his magnum opus. Observing barium xenate or cadmium is not quite as momentous as confirming the theory of relativity, but I can readily imagine feeling a shiver down my spine if I had been presented with that sort of chemical evidence. Evidence that seemed to defy the impossible but which I could nonetheless hold in my hand and keep in my closet. That's the joy of chemistry. After reading this post, I remembered that this is what attracted me to chemistry when I was 15 or so. The joy of getting something concrete in a test tube and making some conclusions with that evidence. Even today, the golden spangles test for lead fascinates me like it did 40 years ago...in fact, the whole procedure for detection of cations in salt analysis is like a magic trick...voila! here is lead chromate, but not barium chromate! When I started teaching, I came to really appreciate Fresenius's work. Ah, the moment of inspiration! So rare, so precious. In the words of Leonard Cohen: "If I knew where the good songs came from, I’d go there more often." Moments of inspiration actually depend upon years of preparation and thinking about things that bug us. To get inspired we first have to understand what is inspiring us. Then, if we are lucky, one day it all comes together, we say Eureka, and feel good. I think a Eureka should be reserved for big breakthroughs.